You'd think after the wonder season just enjoyed by both Leinster and Ireland that I'd have long since used up my annual quota of superlatives by now. Well even if I have, Saturday evening's clash at the Aviva compels me to go searching for more. Because there can be no doubt - this is as close to a World Cup Final as we're going to get before the tournament itself kicks off in Japan. Yes, I said it. And while as Irish fans it's OK to marvel at the thought that we're actually involved in such a big match, we can't forget that's far from the mindset the boys in green will be taking onto the pitch. Make no mistake - Rory & co will be going out believing they can win, and that's exactly how things should be. I always say this when we're facing this opposition…there's not much point in analysing their lineup no matter who is unavailable. Pretty much any team in the world would find it hard to replace someone like Sonny Bill but not this lot. We have to expect them to be fully locked and loaded to do what they're known to do whatever XV is on the park. Which means it's all down to how we handle our side of things, and in fairness, we're actually missing a not-too-shabby test 12 ourselves yet can still field a quality centre pairing. Bundee Aki and Garry Ringrose may not have a whole lot of game time together but with Joe & co working with them throughout the week you can be sure they'll be ready. When I say ‘ready’ I mean of course defensively. I know both know their way to the try line and we'll certainly take all the attacking nous they can bring to the table, but for Schmidt-ball to work a watertight centre channel is absolutely essential. Also crucial will of course be Kieran Marion's display. 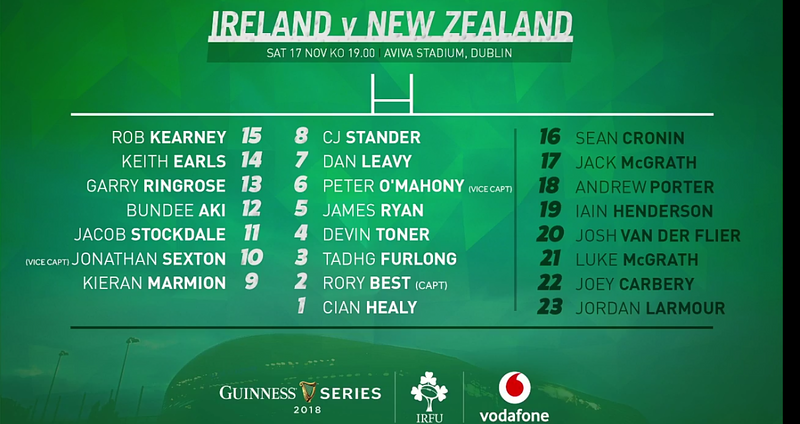 I might have gone with Luke to start but then again keeping faith with the Connacht 9 has to be a massive boost and if he can bring that with hm he'll do just fine. And in between the 9 and the centres is our star man. In my writeup of the Argentina match I showed how our performance went downhill almost from the moment his conversion of the first try went askew. It was an off day for him yet we still won by 11 points. Nobody who has followed his career would even consider doubting he'll be back to his best for this one. In the pack the only tough call was at 7 as far as I was concerned, as Josh van der Flier has barely put a foot wrong this season yet Joe went for Dan Leavy and the margins of excellence are so fine between them it's tough to argue either way. UPDATE - Well there you go… Leavy out to injury, Josh starts, Jordi to the bench. My paragraph above is really going to be put to the test! I reckon it will pass, though it is of course a cruel blow for Dan. When it comes to the second row, I think the Toner/Ryan axis is perfect for starting but despite tipping Iain Henderson to be Man of the Match last week (apologies to those who lost a few bob!) I think it might have been better to give Tadhg Beirne a go from the bench. 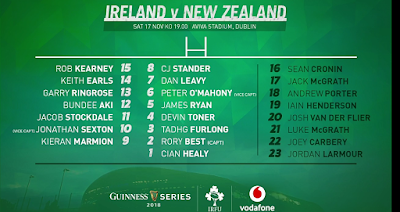 That's nothing against IH - I just think the TB would have no trouble with the importance of the match and could be seen as a ‘wild card’ that the All Blacks might not be ready for (also could have been the bench replacement; again, no offence to Jordi) . Then there's the lineouts. They HAVE to be perfect. After the woes from last Saturday we'll be forgiven for covering our eyes particularly when we've a dart to come in their 22 as those chances simply must be turned into points. But it's not all about Rory - it's an entire system that needs to work and you can be sure they've been putting in the hours to get both calls and execution just right. Our bench has been very good for us in recent times, and there's every chance we'll need it again this Saturday. But whether or not they have a win to bring home for us depends on how we start. You can be sure there's a plan, you can be sure we'll have an idea what it is in the first ten minutes, what the boys in green need to do is make it work. But let's not forget that one aspect I always say is crucial for Joe Schmidt's sides…no matter how much we go out with a memorized playbook, should our opponents manage to drag us away from it we can still compete, especially if our leaders step up. Plus we can't forget discipline; although we were bemoaning that it was poorer against Argentina than the previous week, it was still just six penalties conceded and something that total or less would be another minimum requirement for us. The bookies have an away win by 7 points. That might seem steep, but I reckon it can be used as an extra incentive for the lads. Don't just go out and look for a lucky break…go out there and show them not only why you're ranked second in the world, but why you feel you deserve to move up. Here's to a rocking night in the Aviva. If you're there, get ready to have no voice left at full time. If you're watching elsewhere, be sure to get on all the usual social media hashtag and give the lads all the support you can muster. PS Best of luck also to Ciara Griffin and the Girls in Green against the USA on Sunday. Great to see them getting more November game time! Bench - 16. Dane Coles 17. Ofa Tuungafasi 18. Nepo Laulala 19. Scott Barrett 20. Matt Todd 21. TJ Perenara 22. Richie Mo’unga 23. Anton Lienert-Brown.